The American Tobacco Historic District located in downtown Durham, NC was once the headquarters of the American Tobacco Company (ATC). The ATC campus housed many buildings essential to the operations of the company, including offices, factories, and warehouses. When the company discontinued operations at the historic location in 1987, downtown Durham saw a decline. The company’s vacant factories and warehouses further increased blight and unemployment in the Central Business District. The decline in downtown was successfully reversed by the rehabilitation of this campus made possible by its designation as a historic district in the National Historic Register. As a historic district, the area became eligible for federal and state historic tax credits, thereby providing incentives for redevelopment. 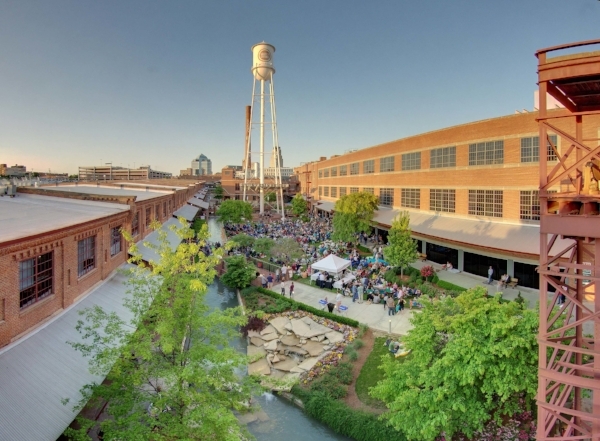 Urban renewal of American Tobacco as a cultural and business district catalyzed new development, new jobs and transformed the urban landscape of Downtown Durham. American Tobacco Campus, Durham, NC. For many years, revitalization efforts for the defunct industrial campus of American Tobacco were unsuccessful. Eventually the complex was purchased by Capitol Broadcasting Company (CBC) in April 2002. Even with federal and state historic tax credits, CBC faced problems in procuring permanent financing from traditional lenders. Finally, it was able to qualify for a $40 million New Markets Tax Credit (NMTC) for Phase 1 from Self-Help, a Community Development Financial Institution based in Durham. The NMTC program was established by the US Congress in 2000 to spur investment in low-income communities by giving tax credits to businesses and real estate projects which locate in such areas. Funding from the NMTC program was pivotal in initiating the redevelopment of the American Tobacco. Local initiatives by the city of Durham were also instrumental in revitalizing the district. For instance, the Durham Performing Arts Center, located in the district, is owned by the city and was built through a public-private partnership. The city also provided funding for two parking decks in the district. Durham Bulls Athletic Park, a minor league baseball park is also located in close proximity to the district. A phased development approach was adopted for the project. 1st Phase: Included office and retail; costs $94 million, 53.2% of which was funded by the NMTC funds. 2nd Phase: Included apartments, condominiums and office space; costs approximately $167 million, 32.1% of which was funded by NMTC funds. The spin off effects of the American Tobacco Historic District have been tremendous. Downtown vacancy rates dropped from 17.9% in 2004 to 11.9% by the end of 2005. Property tax revenues after rehabilitation of the American Tobacco increased by almost 37%. About 6,000 jobs were also added after phase 2 construction. The case of the American Tobacco Historic District emphasizes the importance of tax incentives in rehabilitating historic districts. Tax Credits are instrumental in bridging the gap in financing, which is sometimes very difficult to procure in low-income areas. Innovative methods of financing such as New Market Tax Credit used in the American Tobacco Historic District are critical in materializing a project. Also, to make a project successful, funding and support is often required at the federal, state, and local level. For example, in North Carolina, state historic tax credits provide an additional boost for developers to invest in these projects. The American Tobacco Historic District redevelopment represents the importance of alternative financing mechanisms to revitalize communities and transform the urban landscape of cities.